The Finborough continues with their plays related to the events of 100 years ago "The Great War 100" with a tribute to the ANZAC soldiers, those from Australia and New Zealand, of Gallipoli heroism and massacre in 1915. Alan Seymour's The One Day of the Year sets an Australian family in generational conflict with their opposing views of the national holiday to celebrate the achievements of the Australian forces in World Wars One and Two. Fresh from his role as Farley Flavours in Shock Treatment at the King's Head, Australian Mark Little is back on home territory playing Alf Cooke, an uncouth veteran of the Australian army. Now I don't want to imply that all Australians are uncouth but in this instance it helps set up the dysfunction within the family. Hughie (James William Wright) now at university and with an upper class Australian girlfriend Jan (Adele Querol) realizes his acquired political values are at odds with those of his family. 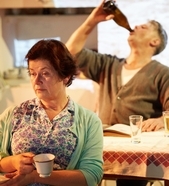 The play is set in Alf and Dot Cooke (Fiona Press)'s kitchen come living room where Alf is whinging about the bloody Poms. The expression POM is an acronym for Prisoners of Mother England and usually applied to the English or British by Antipodeans. To the side of the kitchen is a folding bed which serves as Hughie's room. Joining Dot and Alf is fixture Wacka (the only Brit in the cast, Paul Haley) another veteran and contemporary of both Alf's Anzac father and Alf himself. Mark Little is in his comic element as the grossly embarrassing father, the kind of man who makes us cringe with distaste or laugh at the social equivalents of the massive belch. They say that if you overlay Irish and Cockney accents the resulting melange is Australian. The arrival of Hughie and his posh girlfriend, Jan, has Alf suddenly tongue tied but then he starts behaving like an idiot. Hughie and Jan go to his bedroom with the other three motionlessly watching them. Alf condemns Hughie for his allegiance to all things American and we notice Hughie is dressed like James Dean. While Alf harks back to previous Anzac days when Hughie accompanied him as a child to the parade, Hughie breaks it to his father than he won't be going with him. In fact student journalist Jan and photographer Hughie will record Anzac Day through subversive photographs and a student newspaper article. In the second half, Wacka and Dot watch the parade on television and see Alf on the screen. Wacks describes his experience at Gallipoli, the campaign that led to the death of 45000 allied troops, the stifling heat, the rocks, the lack of cover from the hilly terrain, dysentery and corpses everywhere. Alf arrives back rotten, an Australian euphemism for drunk and in an acting tour de force Mark Little demonstrates the excessive drinking that Anzac Day sees. We also realize how little Australia has done for those wounded in battle, the lost hope for heroes as Alf's work is as a disability ring fenced lift attendant and what he might have been had the war not intervened. I like the evocative plays the company defibrillator produce as we search for a perspective on the murderous Anzac campaign but also see the arrogance of Hughie's generation towards those that fought in this conflict. We look at the class analysis of judgmental children educated beyond their parents' perceptions in Wayne Harrison's lucid production.